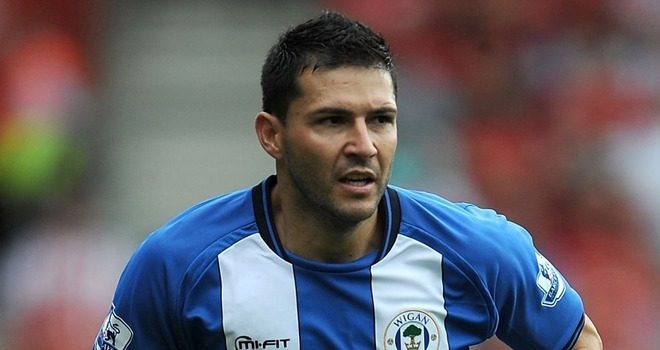 Is Alcaraz good enough for the Blues? When a new manager arrives at a football club, they are inevitably linked with a host of players from their former club. Since the appointment of Roberto Martinez, rumours have predictably linked Everton with a number of players from Wigan Athletic, with the newspapers suggesting that a deal for out of contract centre back, Antolin Alcaraz is close to completion. Alcaraz has been playing in the Premier League for the last three seasons with Wigan Athletic, but I have to admit to knowing very little about the Paraguayan international defender. A look back through his career history and this lack of knowledge is not unsurprising. Despite winning over 25 international caps, and been a regular at the 2010 World Cup, his career has never really taken off since he moved to Europe in 2002. A move to Italian giants Fiorentina in 2002, quickly turned into a nightmare when the “Viola” were demoted to the 4th tier of Italian football for financial irregularities and Alcaraz moved on in the same summer before he had chance to make a single appearance in Italy. His next destination was Portugal and S.C. Beira-Mar, where he went on to become captain and the mainstay of the defence for the Primeira Liga outfit. He started to build a strong reputation in Portugal, and was regularly linked with a move to fellow top flight sides Benfica and Sporting Lisbon, before taking the surprising step of signing for Belgium side Club Brugge. His move to Belgium was considered an overwhelming success, helping to propel Club Brugge to regular European football through consecutive top 3 finishes in 3 successive seasons. The 2010 World Cup in South Africa proved to be a defining moment in his career. Entering the tournament primarily as a squad player, he established himself in the team, playing in every single match as the Paraguayan’s enjoyed a fabulous tournament, reaching the Quarter Final stage before eventual defeat to World Champions Spain. Alcaraz’s fantastic performances at the World Cup earned him a move to the Premier League, with Roberto Martinez moving to sign the centre back for an undisclosed fee, rumoured to be in the region of £3m. Alcaraz enjoyed an almost unbroken run in the Wigan team for the first two years at the club, with Wigan’s defensive record during this time, much improved on the previous and subsequent year. He is perfectly suited to Martinez’ style of play, comfortable and calm in possession, yet unsurprisingly for a South American defender he is strong in the tackle, with his style of play very similar to that of current Everton player and Dutch international Johnny Heitinga. Alcaraz is coming off the back of an injury hit season and Martinez has identified his absence as one of the main factors behind Wigan’s poor league showing. He did return in time for the FA Cup Final, forming part of the victorious starting line-up, where he produced an imperious display to deny Manchester City multi million pound forward line against all the odds. If the 30-year-old Alcaraz is to join Everton it is likely to be as an understudy to Jagielka and Distin and will probably signal the end of Heitinga’s Everton career. The jury will remain out, particularly as he is relatively unknown to the majority of Evertonians, but as a free transfer, the Paraguayan international would represent good business and will certainly add strength in-depth to the Everton squad. His pedigree in continental Europe remains strong, with a number of clubs challenging Everton for his signature. Wealthy Spanish side Malaga are rumoured to be interested and may yet have the financial power to attract the defender to mainland Europe. Next Post Neville to be Martinez’ number 2? He may be good enough – but his time at Wigan has been frustrating! We have played about 130 matches in his time here of which he has started in 75 (and appeared in 2 as a sub). He has been rather injury-prone and whilst he is a very good defender I think he needs to be fit enough to play in more matches than he has for Wigan! Alan, thanks for your comments, very interesting to hear a Wigan point of view on this. What are your thoughts on McCarthy, Kone and McManaman, three others who have been heavily linked since Martinez arrived at Goodison? For me all three are talented players, but are they the kind of player to add quality to the squad you already have? McCarthy is a good young player, and whilst I see Dave Whelan saying his price tag is £20M I do wonder if he is worth that. Overall he had a good season last time out, but I was disappointed with him in several “big” games where we were playing teams around us and for me he chose these days to have an “off day”. Kone undoubtedly can score goals – he got 13 for us in all last year and we were a struggling side. However, I do feel his first touch lets him down and he sometimes gives the impression that he is not in control of the ball. McManaman is an exciting, young player – but a very raw talent at this point in time. He has been on the fringes at Wigan for three seasons and only made an impact in the second half of last season. At this time he needs regular first team football to continue his growth – would he get that at Everton? I’m a Wigan fan and I’ll tell you now, he’s a superb player. Look at our record last year with and without him in the team and see the difference. He’s an absolute rock and the calmest defender I’ve ever seen. Whoever he signs for, he’ll be a massive coup!! Peter, that sounds very positive, you have almost made me excited about the possibility of signing Alcaraz now, have to say I was sceptical before.